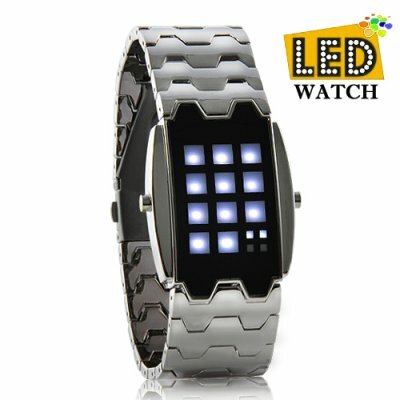 Successfully Added MechX - Japanese Style Inspired White LED Watch to your Shopping Cart. WARNING: The LT28 code name MechX is an exceedingly powerful Japanese-inspired white LED watch. White LED color watches are incredibly rare when compared to the traditional blue, red, or green LED watches. What's more, white LED watches command a higher black market resale value in principal crime havens like the Laughing Man Atoll. Another reason why the LT28 is so sought after is because of its Plutonium powered watch battery. Only micro-nuclear power for confinement systems through a Reverse Richards Fission Process (named after Dr Reed Richards) can generate the correct power level to activate the white LED's. But once they're activated--OH BOY! Telepulsion Punch (aka Proton Punch) - energy bolts from fists! Double Shaft (aka Spartan Javelin) - twin Cosmic arrows that slice galaxies! Pulsar Cannon (aka Chest Cannon) - torpedoes from the torso! Eye Blaster Rifle (aka Laser Eyes) - think X-Men Cyclops but times a gajillion! MechX owners might include: Thomas Anderson aka Neo, Mary Anne Evans aka George Eliot, DJ Cerla aka Floorfilla, Jenna Marie Massoli aka Jenna Jameson, Glenn Bolton aka Daddy-O, and YOU! So order yours today before they're all snapped up by the Ferengi! Brought to by your online merchants of cool - Chinavasion. Press the right button to display the time on demand. How do you read the time on this watch? To view the time, simply press the A button (right). The first time you press it, it displays hours. Each of the big lattices (squares) represents one hour. Press the A button again and you will be shown minutes. In minute mode, each of the big lattices represents 5 minute intervals while the small lattices represent 1 minute intervals. On the other hand, if you press the B button (left) it will display the months. Press it again, it will display days. How do you change the time on this watch? Push both A and B buttons for at least 3 seconds to enter setting mode. Then push A for adjustments. Adjustment order is HOUR, MINUTE, MONTH, and DAY. What the heck is Keter Object Class? Dangerousnous rating as per the SCP Foundation.